According to new psychological research, there is an increase in aggressive characteristics in an average Russian, but scientists say the trend can be reversed. Russians have become more conflict-prone, angrier and ruder and have largely lost the ability to control themselves, according to the findings of research into the psychological profile of a typical Russian from 1981 to 2011. Andrey Yurevich, the deputy head of the Institute of Psychology at the Russian Academy of Sciences, talks about the study’s results. Rossiyskaya Gazeta: Judging by your findings, compared with the 1980s, Russians have become three times as aggressive and rude and absolutely uncivil. But how do you measure, for instance, aggression? Andrey Yurevich: Let me begin with a clarification: this is not a statement covering "all Russians." We are talking about the general psychological characteristics of society as a whole, "the hospital's average temperature" as it were. As for ways of assessing and measuring the level of aggression, the easiest one is to look at statistics, e.g. the number of serious crimes associated with aggressive behavior. The most telling statistic is the number of murders. In that respect, Russia's figures are nearly four times as high as those in the United States and about 10 times the figures in most Western European countries. 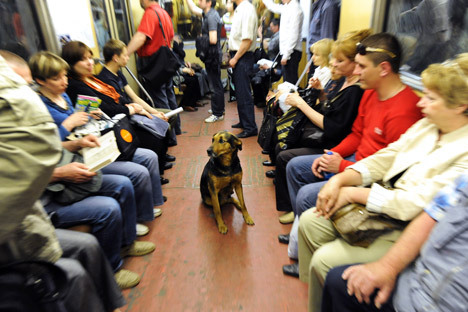 Another method is sociological and socio-psychological surveys, for example, when researches get on the subway, walk into a carriage and ask for a seat and then record how many passengers would give them their seat and how they react to the request. Finally, there is our everyday personal experience. We use the public transport, see how drivers behave on the road, watch our fellow compatriots in the shops, in the street and, should we want to, we can always count the number of times a week or a month when people were rude to us or disrespectful. RG: My impression was that people now are more willing to offer their seat to somebody who needs it more. A.Y. : That is true. In the early 1990s that happened very rarely, whereas now you see it far more often. At the same time, if we talk about serious crime, there is a clear trend: some 80 percent of murders in Russia are committed as a result of an outburst of aggression. Statistics show that there is domestic violence in one in four families in Russia. Most of those families have a low income, are poorly educated and both parents have a serious drinking problem. RG: Your study says that aggression is made fashionable by the media and the criminal world. How does that happen? A.Y. : In the criminal world, aggression is the norm. And the criminal culture has had a very strong influence on our society since the late 1980s. It has become the source of lots of borrowing, starting from the criminal slang to models of behavior (for instance, when a husband and wife hire professional killers to resolve a dispute between them). The word aggressive is often used with a positive connotation: "aggressive advertising" means good advertising; "aggressive car design" means good design. A fashion for aggression is further contributed to by various subcultures, like football fans or nationalist groups. People in power and the media often contribute too. For instance, some TV programs promote a rather aggressive attitude to some countries, present the world around our country as hostile and dangerous, and the image of an enemy, which was so topical in Soviet ideology, is still very much alive. Dissatisfaction with the authorities too breeds aggression. Furthermore, since ordinary people cannot "get to" those in power, they often channel their irritation and anger onto each other and onto various social groups. RG: Are there any mechanisms for restoring one's humanity? A.Y. : It would appear that no nation can remain in an excessively aggressive state of mind for long. For the time being however, the level of aggression in our society is quite high and one could speak only of some marginal improvements rather than of a drastic change. We are moving further and further away from the early 1990s (break-up of the Soviet Union, a deep political crisis), when society lived through most dramatic upheavals, and are gradually calming down and getting used to the new reality. In addition, many Russians spend their holidays abroad, mainly in very friendly European countries, see how people there treat each other, realize that friendliness and kindness are the norm in social relations, learn to appreciate this norm and bring it back to their home country. RG: Are there any ways of getting rid of anger and aggression faster? A.Y. : There are, as there are special psychological methods for that. For example, in the United States, when aggressive driving causes a traffic accident, the driver is required to attend a special training in anger management. Western countries are becomingly increasingly more interested in so-called "positive psychology" that teachers that if a person develops a positive image of oneself, of one's life and the surrounding world, their relations with people improve considerably and there is no aggression anywhere. Another powerful channel of influence is education and upbringing. It is very important that the education system instills a positive attitude to the world. Take, for example, new Russian history textbooks. Somebody has done the math and calculated that they contain far more negative episodes from our history than positive ones. Whereas in the United States the opposite is true: children there are taught a polished-up version of their history, which impresses Americans with a positive image of their country and their people. Clearly, that would imply a certain conflict with the objective truth. What is needed is a healthy balance because the predominance of negative episodes creates a negative image of the history of one's country and, as a consequence, of the country as a whole. This is abridged version of the article first published in Russian in Rossiyskaya Gazeta.